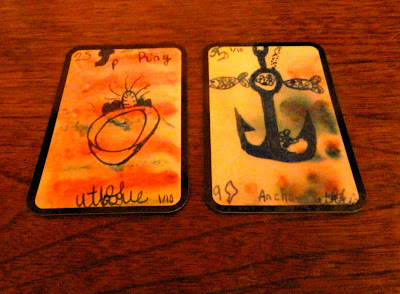 Weekend Reading: Ring + Anchor from A Child's Lenormand by Anna Guthrie, age 10. Whatever you commit to this weekend, be sure to keep your commitment. The Ring represents a promise or offer you've made and the Anchor is about stability and perseverance. So keep to it, not just for the sake of your word, but also because Anna's Lenormand says to. Her follow-through resulted in this fabulous deck and a nice chunk of pocket change. There's no telling what your follow-through will net.